Watercolor from live specimen found along Sycamore Creek in the Mazatzal Mts., Maricopa Co., Arizona. 20 July 1992. 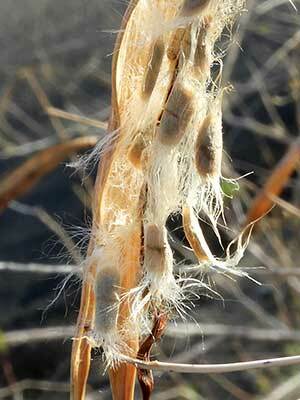 Fibers attached to the outer seed coat aid in dispersal by the wind. Along Skunk Creek, Peoria, Maricopa Co., AZ, 24 March 2018. TREE. Along desert washes that have a reliable underground water source this tree can attain a height of 6 m or more. Drooping branches and willow-like leaves, but not at all related to true willows (Salix). FLOWERS: Purple and pink tinged trumpets about 4 cm long. 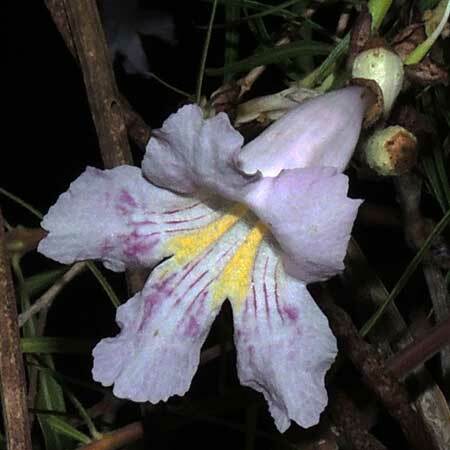 Flower color varies from white to deep magenta. LEAVES: Simple leaves, 10 to 30 cm-long, strap-shaped, thickened and leathery. They have a shiny, resiny surface. FRUIT: A long (15 cm), narrow, papery pod packed with cottony seeds. RANGE: Widely distributed along streams, riparian areas, and washes with deep alluvium and underground water source. Wildlife: Buff-colored cocoons about 25 mm in length are made by the inchworm moth, Eucaterva variaria. The adult moth is white speckled with black. Also, a spectacular hawk moth, Manduca rustica, is known to use this plant in the larval stage. Hummingbirds and large black carpenter bees, Xylocopa californica arizonensis, rely on the Desert Willow's flowers for nectar. Colorful leafhoppers known as sharpshooters can be found drawing sap from developing pods and shoots.